CF-MIT at Downsview - CYZD, Ontario. CF-MIT at Nakina - CYQN, Ontario. • CF-MIT Eastern Provincial Airways Ltd., (EPA), Gander, NL. Delivered 05-Jul-1960. Accident: 115 miles south east of Goose Bay, NL. 22-May-1970. Controlled collision with the ground caused by a fatigue failure of the engine structure. Substantial damage. • CF-MIT Austin Airways Ltd., Timmins,ON. Circa 1970. Accident: Abitibi Canyon, Fraserdale, ON. 04-Sep-1976. Pilot and nine passengers died. Further details of the incident shown in the narrative below. 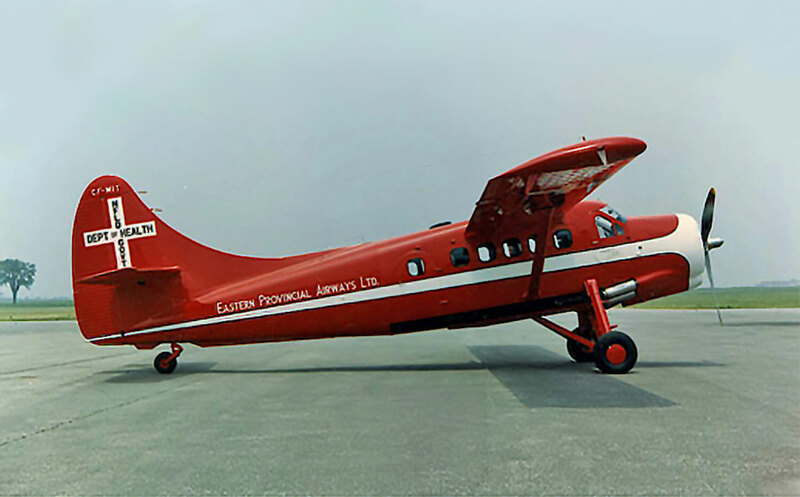 Otter 372 was delivered to Eastern Provincial Airways Ltd., (EPA), Gander, Newfoundland on 5th July 1960, registered CF-MIT. It was initially allocated to EPA's air ambulance service, based at St.Anthony, where there is a hospital. It was painted in EPA's all red colour scheme with white cheatline, and carried “Newfoundland Government Department of Health” titles on the tail. It replaced a Beaver CF-JAT, which had provided the ambulance service up to then, but which was moved to Northwest River to operate from there for the Department of Health. Marsh Jones, in his book on EPA “The Little Airline that Could”, describes MIT's delivery: “Another new Otter was bought and my family accompanied me on the delivery flight from Toronto on 6th July 1960. MIT was destined to become the International Grenfell Association flagship, based in St.Anthony. Our routing was down the north shore of the St.Lawrence with stops at Lac-à-la-Tortue and overnight at Sept Îles, then non stop the following day to Gander. Flying time was eleven hours and five minutes”. EPA's air ambulance service was an essential facet of the company's diversified operation, flying under contract with the provincial Department of Health, and in conjunction with the International Grenfell Association. The Otter was used to transport patients to hospital and in some instances medical personnel were flown to outlying settlements for emergency service. As with all the EPA aircraft, MIT was registered to Eastern Provincial Airways (1963) Ltd., in September 1963. It continued flying as an air ambulance until 1967, when that particular contract was taken over by a Turbo Beaver, and MIT then joined the general EPA Otter fleet, flying as a passenger / freighter aircraft. On 22nd May 1970, CF-MIT had a “controlled collision with the ground” due to a fatigue fracture of the engine structure, 115 miles south east of Goose Bay, Labrador. The Otter was on wheel-skis atthe time and was substantially damaged. It was taken to Field Aviation for repair. During 1970, EPA's bush division was sold to Labrador Airways Ltd., but MIT was not part of that sale. After repair, it was sold to Austin Airways Ltd., of Timmins, Ontario and continued to fly for Austin Airways until destroyed at Abitibi Canyon, Fraserdale, Ontario on 4th September 1976, a crash which resulted in the deaths of the pilot and nine passengers. 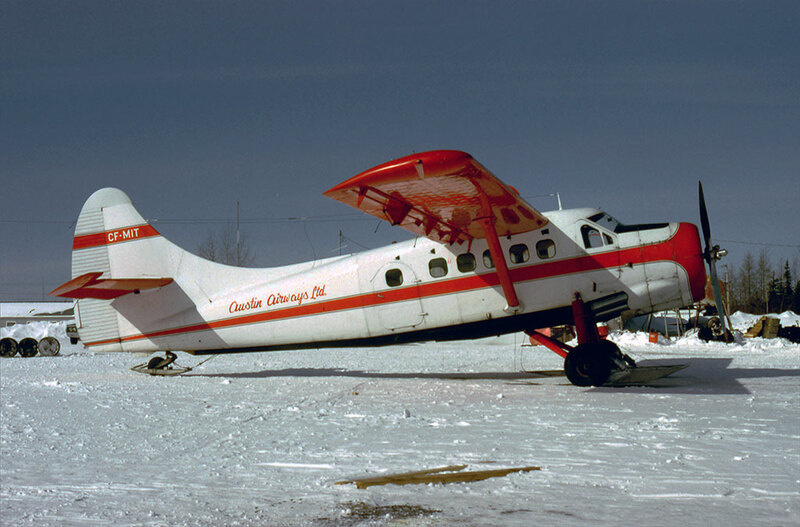 The Otter was one of two floatplanes chartered for the Royal Commission on Electric Power Planning for Ontario, to transport 13 people on a fact-finding tour of northern Ontario. The tour was to last four days, commencing on 30th August and terminating on 2nd September at Timmins. Delays in completing meetings extended the tour time by one day. On 3rd September the Otter departed Winisk on a direct VFR flight to Timmins / South Porcupine, with an estimated time of arrival of 23:00 hours. The other aircraft remained behind to allow four passengers to go fishing. Deteriorating enroute weather compelled the pilot to divert to Moosonee, where he landed at 22:40. The passengerswere advised that space was available aboard a company DC-3 which was proceeding northward to Attawapiskat before returning to Timmins. They declined this alternate transportation and overnighted at Moosonee. On Saturday 4th September '76 at approximately 12:00 hours, the pilot while preparing Otter MIT for flight, called the local company radio operator to request weather information for his VFR flight toTimmins. The operator transmitted the 11:23 terminal forecast for Timmins, the 10:00 observation for Moosonee and the 11:18 special observation for Timmins. The terminal reports for Moosonee and Timmins were much better than forecast and acceptable for VFR flight. At about 12:10 the radio operator at Moosonee received a special weather observation for Timmins which indicated deteriorating weather but did not pass this vital information to the pilot at that time. The Otter departed at 12:30 and shortly after take off the pilot advised the company operator at Moosonee that his estimated time of arrival at the South Porcupine seaplane base was 14:30. A few minutes later the radio operator attempted several times to contact the aircraft, to pass the new weather information,but without success. No other radio transmission was heard from the Otter. Because the flight was operating under VFR rules and because some of his passengers had limited time to make airline connections at Timmins, the pilot elected for the direct route, a distanceof 165 nautical miles between the Moosonee and Timmins NDBs. To follow this route, the pilot would have used his ADF radio equipment and / or map reading techniques. Considering the cloud ceilings were at about one thousand feet and some terrain in the area rises to 950 feet, the deteriorating conditions would have induced the pilot to divert from the planned track. Since the accident site was 28 miles west of the direct track, it is probable that he diverted westward toward lower terrain to go around poor weather. Arriving at the Abitibi River, he followed the river southward to the accident site near the Abitibi Canyon Dam. The valley narrows and the terrain rises at this site of the power dam. It is believed that the pilot found the visibility decreasing rapidly in dense upslope fog in this vicinity. At 13:37 hours the aircraft struck the high tension electrical cables near the generating station and crashed to the ground. After impact a fire developed and consumed the aircraft, which had 11,573 hours on the airframe at the time. From the geometry of the wirestrike, it is probably that the pilot saw the wires and commenced a climbing turn to try and get over them, but had insufficient time to avoid the collision. The brief epitaph of this Otter, and many before and after, reads “continuedVFR into adverse weather”.